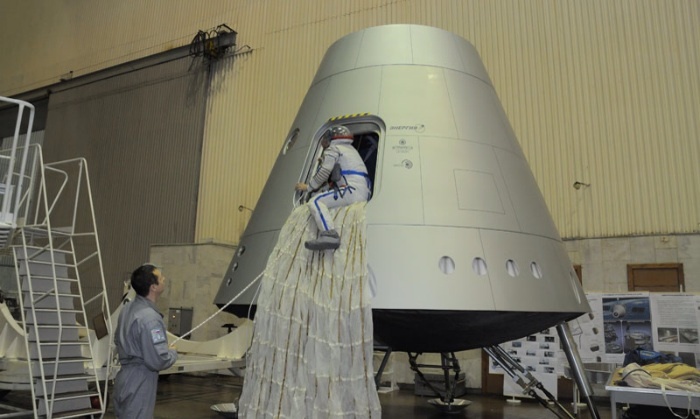 The new capsule is being designed to carry six cosmonauts, similar to the US Orion capsule. It will be launched on the Angara rocket, a new booster which is now in development. The photos show crew operation trials conducted by S.P. Korolev RSC Energia and the research institute of the Gagarin Cosmonaut Training Center back in August. According the RSC Energia, the tests included ingress, emergency escape from the capsule on the launch pad, and unassisted egress from the capsule after landing on solid ground outside its designated landing area. The photos show landing legs, which may prevent the new capsule from toppling over after landing, as Soyuz is prone to do. But, like NASA’s Orion capsule, the New-Generation Advanced Manned Transportation Spacecraft will do nothing to reduce the cost of access to space, nor will provide new capabilities beyond those which the US and Soviet Union possessed in the 1960’s. These photographs are similar to recent photos which show NASA astronauts climbing in and out of Orion mockups. Sadly, both remind us of photos taken 40-50 years ago. This is what government space programs call “progress” these days — and politicians wonder why the public does not find their space programs exciting? Wow, just when Energiya were the last guys standing, now they decide to replicate the over-politicized engineering ventures NASA used over the past decade + to shoot itself in the foot. Angara magnum booster? And, what are those symmetrical penetrations in the pressure shell–redundant umbilicals? The side hatch cannot possibly be used as a docking hatch without adding a substantial collar around it (and destroying the CG), so now they also have a tremendous mass penalty from redundant hatches? It’s kind of hard to look at this. But, thanks for the news! 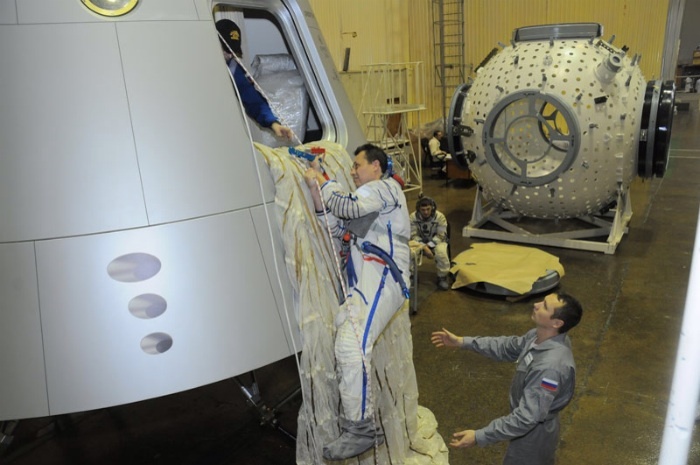 The new capsule is being designed to carry FOUR cosmonauts.